Think about the holiday that is tomorrow in the United States: Thanksgiving. Now look at the words that make up this term: Thanks and Giving. 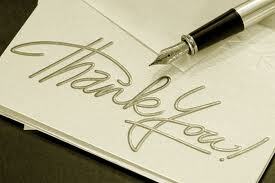 When was the last time you gave a “thank you” to the people who are in your life? Your clients, your referral sources, your family? “Thank You” is one of the most powerful phrases you can use and they can transform your rainmaking and business development as well as your life. Yet, we sometimes forget to say thank you to others because we are so busy with our own lives. “Thank you” is an expression of gratitude that you give to others for everything they have done for you. When you genuinely thank someone for what they have done for you, whether it is big or small, you will find that people will go out of their way to try to help you even more because they know you are appreciative. And while we set aside one day a year in the United States as a day of gratitude, it is a phrase you should be using always and often. And on a personal note: It is with deep gratitude that I thank all of the readers of these Rainmaking Recommendations. Please enjoy a safe and happy holiday.